Even though I've heard of Bobolinks, I had never actually seen one in its summer colors until the other day. Boblinks are small songbirds - members of the blackbird family - that dwell in the Northern parts of the US which is where I live. The other day I took a very long walk and went by a favorite field of mine. 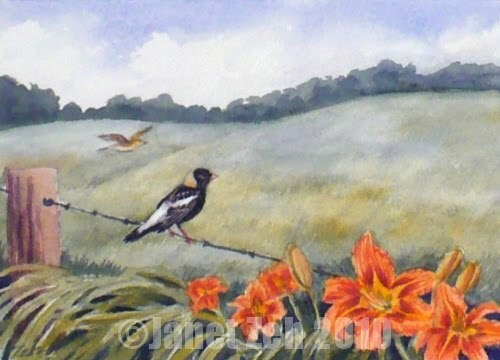 At this time of year, it is lined with bright orange daylilies growing wild by the side of the road. Suddenly a bird flew down and landed on the barbed wire fence right nearby. It was singing such a lovely melodic tune as it swooped to its landing place. I was stunned to see it's bright white back and dark black color and a light cap on the back of its head. Its golden brown mate swooped to the fence as well. I had no idea what these birds were! So upon arriving home an hour later, I looked them up. Now I know. The male bobolink which is so stunning in the summertime looks very much like the plainer female in the winter. At that time they migrate to South America. I just had to do a painting of my memory of the scene. Hope you like it.